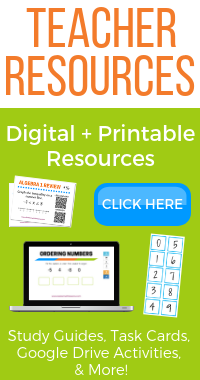 ​Percents, decimals, and fractions are 3 different ways to describe the same amount. For example, one half can be described as 50% (a percent), 1/2 (a fraction), or 0.5 (a decimal). This lesson will show you how to convert back and forth between the different forms. The word percent means "per 100." 20% means 20 out of 100, or 20/100. 67% means 67 out of 100, or 67/100. So to change a percent to a decimal, you simply divide the percentage number by 100. 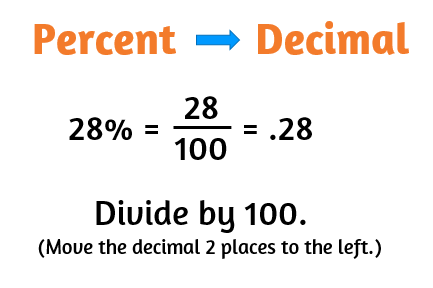 When you divide by 100, the decimal just moves over 2 places to the left. Remember, the word percent means "per 100." This means you can change a percent to a fraction by dividing by 100. Don't stop here though, make sure to simplify the fraction if possible. Look to see if the numerator and denominator can be divided by the same number. 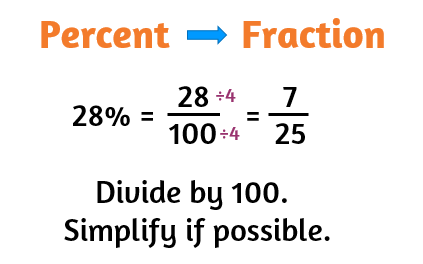 If the percent is a decimal, it takes an extra step to simplify the fraction. To get rid of the decimal, you will need to multiply the numerator and denominator by a power of 10 to move the decimal over first. Once you do this, you can simplify the fraction like normal. First, figure out the place value of the last digit on the right. Is it in the tenths place? Hundredths? Thousandths? 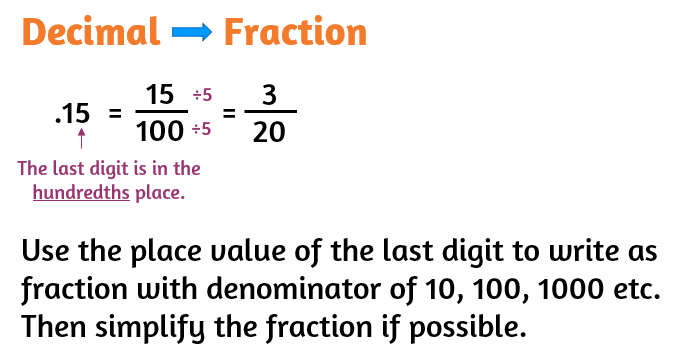 Use the place value to write the decimal as a fraction over 10, 100, 1000, etc. Then simplify the fraction if possible. Remember, the first place to the right of the decimal is the tenths place. The second place is the hundredths, then thousandths, ten thousandths, and so on. 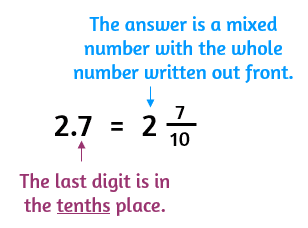 ​In the example below, the 5 is in the hundredths place. The decimal .15 is the same as 15 hundredths so we can write it as 15/100 and then divide the numerator and denominator by 5 to simplify the fraction. If the decimal includes a whole number out front, you just keep the same whole number out front and write your answer as a mixed number.